Málà, which translates to mouth-numbing, refers to the saliva-inducing, buzzing sensation that the Sichuan pepper creates the moment it hits your tongue. It is the essential ingredient to málà tāng (Chinese: 麻辣汤), a type of “DIY hot pot” experience that can be found around the city in various hole-in-the-walls. Typically served from late afternoon to dinnertime, this warming dish might range in ingredients and level of spice–a detail that disproves its misleading name. A stack of basket sits alongside a large, glass slide-door refrigerator that displays stacks upon stacks of skewered vegetables, fishballs, meats, poultries, eggs, and seafood. There are also various types of noodles, tofu, and bean curd products that can be added to your personal selection. Customers are typically given a baseline price of 8 kuai to be added onto if more ingredients are chosen. Each additional ingredient can range from 0.5-1 kuai for vegetables, carbs and tofu and 2-3 kuai for meats, poultry and seafood. The variety of ingredients for the soup can range, but mala tang vendors typically provide everything from poultry, beef and pork meat/innards, a variety of cellophane, rice, and egg noodles, different flavors of fishballs, various forms of tofu/bean curd, octopus, squid, shiitake mushrooms, oyster mushrooms, enoki mushrooms, bok choy, various leafy greens, bean sprouts, cilantro, broccoli, cauliflower, and potato. The broth is boiled from pork belly, chicken bones, ginger, Sichuan peppers, and possibly MSG. 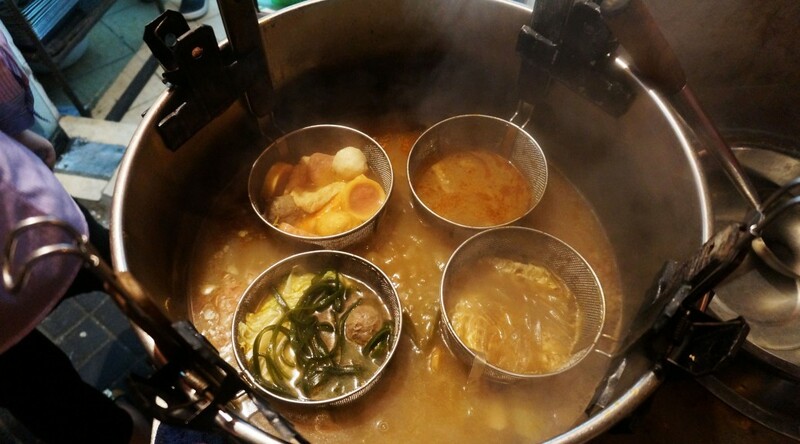 After ingredients are chosen and handed to the cook, the ingredients are placed into a wired sieve spoon that is immersed into a boiling pot of broth that becomes infused with more and more flavor as ingredients are added in from various customers’ orders. Once the ingredients are cooked, they are dumped into a bowl and a sprinkle of garlic, chili pepper, chili oil, minced scallions, sesame oil, black vinegar, and crushed Sichuan pepper can go in before the broth is poured in to complete the dish. Before becoming a popular street food specialty, mala tang was a popular meal eaten among poor travelers and laborers in Sichuan province. It was said to have been a culinary innovation of the fishermen along the Yangtze River. For meals, they would collect stones to make a fire, get water from the river to put inside a crock pot for boiling water, gather wild vegetables for the broth, and create their own sauce to season their soups. Another tale recounts the story of six old women who made food for the stonemasons as they were building the Leshan Giant Buddha in the Sichuan Province. The women prepared meat and vegetables on a stick and immersed them into the seasoned broth to cook before serving.